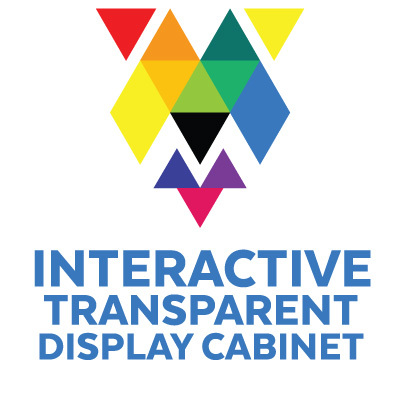 Interactive digital touchscreens are man-sized screens that are smart, fun and engaging. 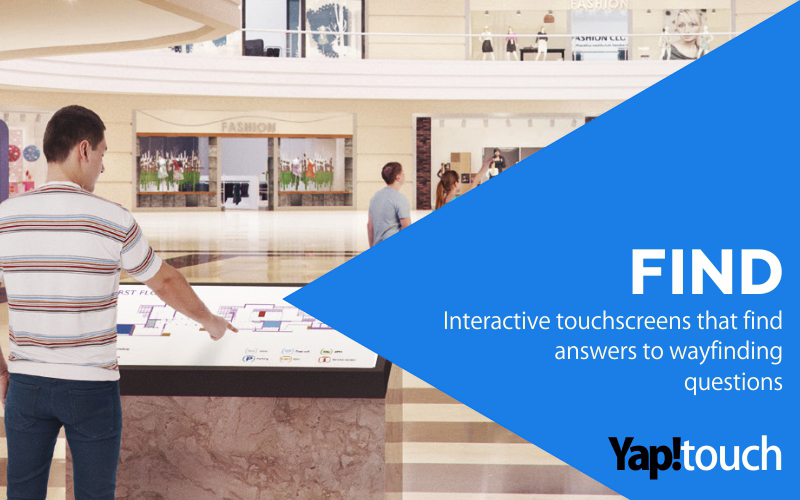 At Yap!touch we like to think of touchscreens as a modern day salesman, or information counter, a handy digital signage map to help you find your way, or a sales tool that collects data and trains staff. 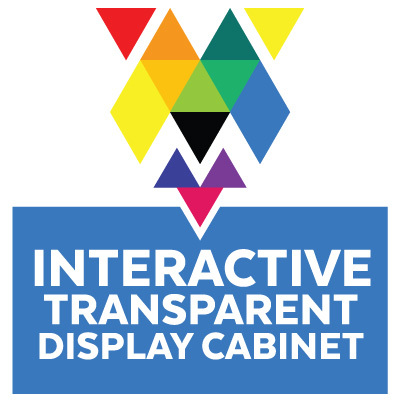 Touchscreens offer an exciting interactive digital signage experience. 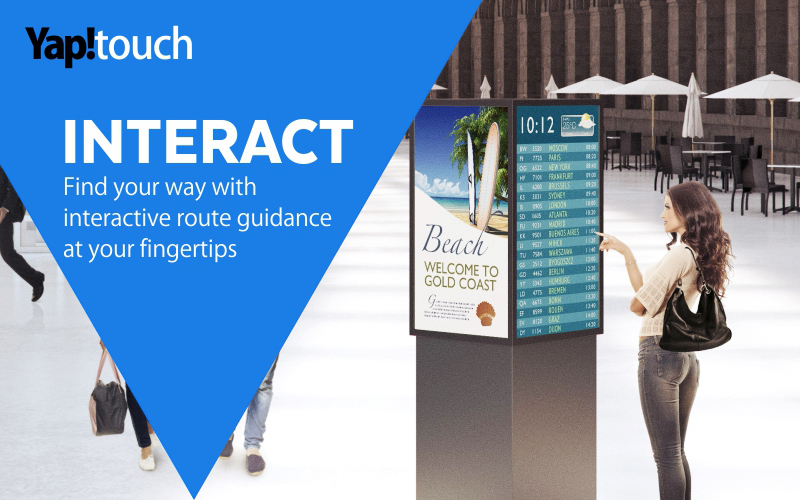 They promote 2-way interaction – without the need of a second person! In short, a perfect sales tool that delivers on-message information that’s fast and fun, simple yet sophisticated. Like tablets, touchscreens respond to finger touch that lets your customers find the answer in a clear, consistent, logical format that engages and inspires. 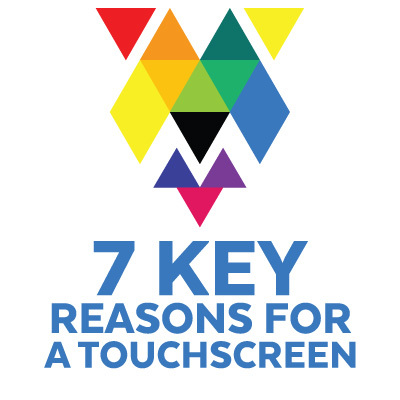 Here are our 7 key reasons to invest in a touchscreen. 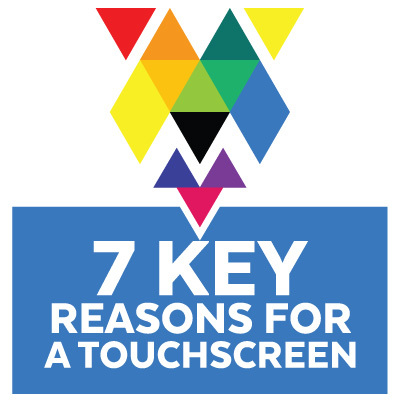 Touchscreen’s allow your customer to relate to your product in a way that outperforms conventional marketing techniques. 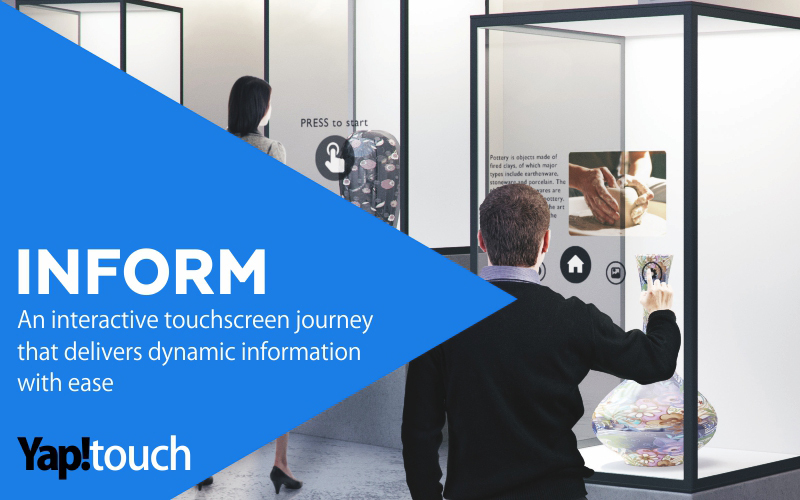 Forrester Research highlights that as much as 80% of retailers with both physical brick-and-mortar establishments and online stores, intend to install and make use of interactive touch screen kiosks at their locations. Touchscreen kiosks come in many shapes and sizes. Vertical kiosk styles or horizontal tables are increasingly popular. 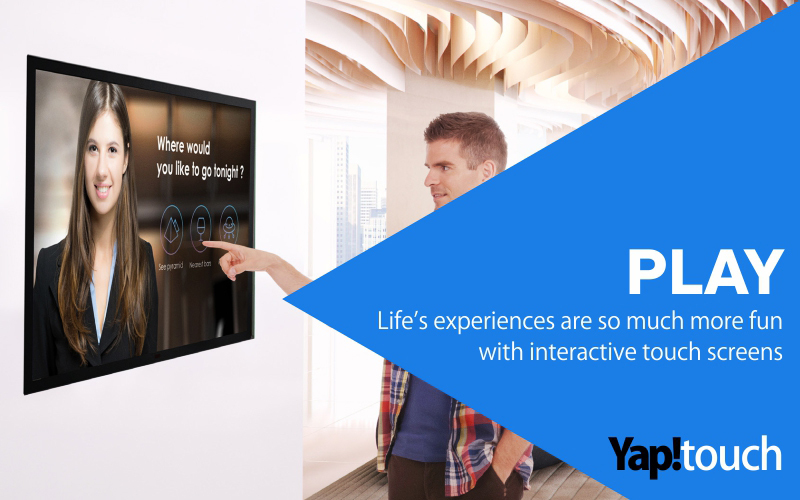 We know that your audience is unique, which is why the Yap!touch team offers multiple sized products and systems to create the best solution for you. A stylised housing surrounds the interactive display screen which is sensitive to touch. Beneath the housing a computer interface networks the device to a central hub – where content programming drives the targeted messaging. 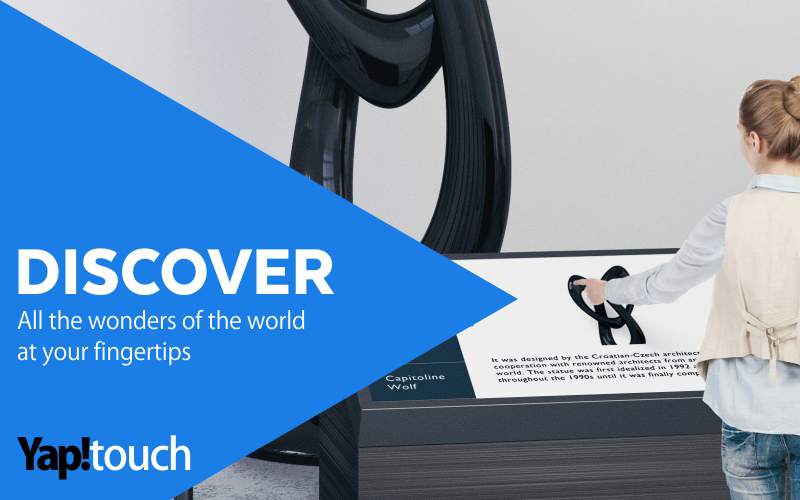 Interactive transparent touchscreen display cabinets are idea in museums, corporate receptions, exhibition stands, hotel lobbies – read more about how digital signage can take you on a journey here.